Lauren Bacall: A Rememberence - Watch RARE Video Of Bacall in the TV Production of Applause! Home/Entertainment/Lauren Bacall: A Rememberence – Watch RARE Video Of Bacall in the TV Production of Applause! They met in 1944. By 1945, Bogart had announced that he was divorcing Methot, a violent alcoholic. Bogart was tortured by his love for Bacall and his desire to save his marriage. He left Methot, then returned to her less than two weeks later in November of that year, but in the end, the “Battling Bogarts,” as they were known, called it quits. Bacall was his fourth wife, and yet Bogart was so undeniably smitten, Bacall was probably the only woman who had the power to render even Marilyn Monroe about as appealing as a bowl of chopped liver. Bacall, was a bewitching actress with a husky voice and smoldering onscreen chemistry that helped make her a defining movie star of the 1940s and who decades later won Tony Awards in the Broadway musicals “Applause” and “Woman of the Year. After Bogart died in 1957, she was engaged to Frank Sinatra and had a turbulent marriage to actor Jason Robards Jr. She was a longtime resident of the Dakota apartments in New York, but her social life extended far beyond the city. 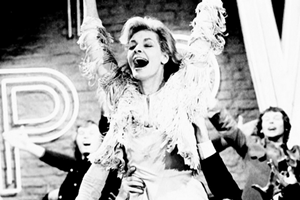 She won her two Tonys in roles made indelible onscreen by other powerful actresses. She played an aging actress threatened by an ambitious upstart in “Applause” (1970), a stage version of the Bette Davis film “All About Eve.” And she filled the Katharine Hepburn part of a high-powered journalist in “Woman of the Year” (1981). Bacall continuted towk onscreen. She played a brassy widow in “Murder on the Orient Express” (1974), based on the Agatha Christie mystery, and an actress stalked by an obsessed admirer in “The Fan” (1981). She took much smaller roles to work with directors she admired, including Lars von Trier (“Dogville,” 2003) and Paul Schrader (“The Walker,” 2007). After losing her Oscar nomination in 1996 to Juliette Binoche in “The English Patient,” Ms. Bacall told the Times of London that “the phone went completely dead, which shows you what a fickle business it is. It’s one of the reasons why I continue to work, because I know how it is not to work. Thank you for that clip. Although it was TV it is such a shame that Broadway shows are not filmed for future archival purposes. And for the enjoyment of gay men!